Hainsworth Technology has been working in the Middle East for more than 40 years and will once again be exhibiting at Intersec. Along with our partner Bristol Uniforms, we understand the importance of investing time in developing long-term relationships in the Gulf region. While the technical capability of our products remains hugely important, relationship building matters more here than anywhere else in the world. Through Bristol Uniforms, we now supply all of the United Arab Emirates with several thousand firefighters wearing our TITAN 1220 fabric, a Hainsworth Technology. In the last few months, our partnership with Bristol Uniforms has also seen the Civil Defence in Bahrain take TITAN 1220, while we continue to have a long-standing relationship with the Civil Defence in Qatar. Hainsworth Technology’s involvement in the Gulf extends beyond Civil Defence into the region’s hugely important industrial sector. TITAN 1220 is the fabric of choice for emergency teams operating in industries including oil and aluminium smelting. TITAN 1220 remains Hainsworth Technology’s most popular fabric having been tried, tested and requested for many years worldwide. The fabric combines the flame resistant properties of specialist fibres with a unique patented fabric construction to provide dynamic thermal protection and outstanding durability in the most demanding of environments. TITAN 1220 has been engineered specifically to meet the exacting requirements of structural firefighters. It is the most durable TITAN technology for its weight, making the fabric breathable and comfortable to wear. This year, as a result of its continual product innovation and development, Hainsworth Technology has been promoting TITAN 1260. TITAN 1260 complements the existing 1220 and 1250 systems by adding flexibility after flashover with the fabric remaining flexible with minimal carbonisation, ensuring that the garment remains intact and does not break open after exposure to flame and cooling down. TITAN 1260 has successfully undergone a number of trials which have demonstrated its enhanced breathability, durability and protection. The PBI, DuPont® Nomex and DuPont® Kevlar combination contains a specially developed yarn to provide a smoother fabric surface which reduces fibrillation and consequently improves airflow to ensure maximum breathability and comfort. All TITAN products have a high level of repellence to water, acids, alkalis and gasoline. This level of performance is achieved by the high performance and proprietary REPEL+ finish which is standard on all TITAN fabrics. REPEL+ is designed to keep firefighters dry and comfortable without affecting the breathability of their gear, even after repeat washing. REPEL+ meets the chemical protection and spray rating requirements of EN469:2005, even after regular laundering. Hainsworth Technology is also starting to see growing interest in the Middle East in its ECO-DRY product range, both outer shell and linings, which harness the many benefits of wool – nature’s performance fibre. We have recently returned from a visit to the Gulf and the overriding issue among firefighters in the region remains heat stress management. This goes a long way to explaining why Bristol Uniforms garments with Hainsworth Technology fabrics are in such demand. The ergonomics of the kit worn by our customers in this part of the world are second to none. A huge amount of investment, time and technical expertise has gone into the development of garments which are highly designed, flexible, lightweight and easy to move around in. 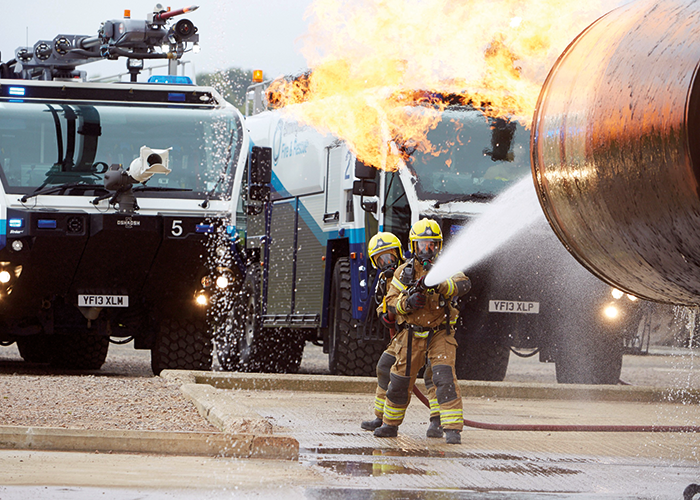 Hainsworth TITAN 1260 fabric is tested to the limit in this airport emergency scenario. Hainsworth Technology has three core product messages that underpin our approach to fabric design – design that saves, protection that shows and quality that lasts. Heat stress, if not managed and monitored effectively, not only imperils the life of a firefighter but, on a more day to day basis, can seriously harm someone’s decision-making ability which, in turn, then potentially puts the lives of colleagues in danger. By managing heat stress effectively, you are not only managing physical health, but also the mental health of a firefighter. Those responsible for the procurement of PPE are looking for a holistic approach from Hainsworth Technology and our partners. They are looking for a complete understanding of how our fabrics interact with the various layers in the system. Serious consideration is given to each layer to offer the best possible performance which encourages effective moisture movement through the system and, with it, the best possible heat stress management. As is the case in other parts of the world, the health (as well as safety) of firefighters is an increasingly important area of discussion. It is something Hainsworth Technology has made a critical part of the research and development work carried out at its UKAS accredited laboratory for a number of years. This is why durability is such a key consideration in the design of all products. In order to decontaminate turnout gear, regular washing is required. But durability of kit is essential due to the abrasive nature of the wash process. Hainsworth ensures its fabrics work harder to keep firefighters safer for longer; good colour fastness to light and washing; low repair and replacement rate compared with other weave and fibre combinations; and greater breathability for longer due to the unique patented construction. Hainsworth Technology is unique in being able to tap into more than 150 years’ experience as a manufacturer of industry-leading fabrics for firefighter PPE allied to its position as a global exporter. We recognise the importance of working with industry-leading partners and of building long-term and dynamic customer relationships in order to provide firefighters with the best possible garments. Firefighting kit is not something you can buy off the peg. Today’s firefighters are expected to perform a vast and complex array of duties – all very different depending on whether a firefighter is stationed in Abu Dhabi, London, Detroit or the Australian Outback. It is the responsibility of companies like Hainsworth Technology to ensure that the kit our firefighters wear each day gives them the confidence that they will return home safely at the end of their shift.